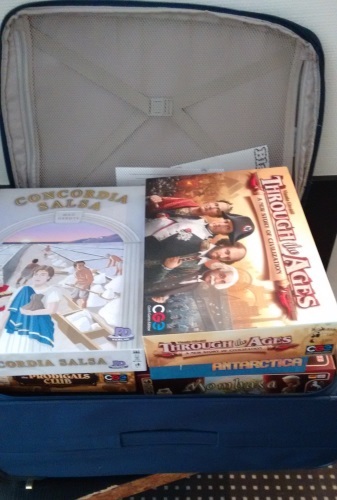 Essen Spiel 2015 has been and gone and was, once again, a fantastic show – and a real suitcase filler in terms of review copies. So now I have started the mammoth (but fun) task of playing them all. Unless it’s one of the ‘One Play’ blog posts (which kind of speak for themselves) I like to play a game at least four times before reviewing it, so don’t expect these to arrive too quickly. However I’d hope to have most of them up by Christmas. I got around half of my Essen Spiel wishlist this year – and if I’d had another suitcase, and more free time, I could’ve doubled that haul. Most publishers are very generous with review copies if you approach them in the right way (a blog post on that is incoming), but I only took what I thought I could do justice to – and carry! 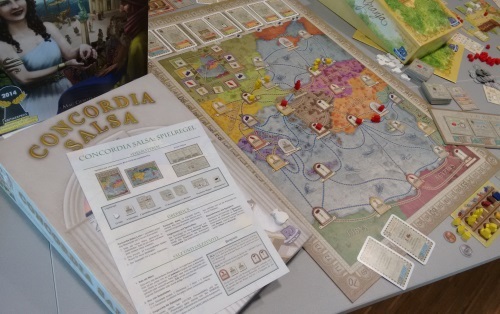 Something I’m yet to do is board game expansion reviews – but I now have Concordia Salsa, Tash Kalar (both expansions) and Pickomino – Extra Worm to cover – plus Keyflower Merchants from before Essen. I need to find a format for these expansion, so all suggestions are welcome! What would you want to see in an expansion review? What are the key things you look for when considering buying one? It wasn’t (quite) all freebies or discounted items collected for review though. I also grabbed Smash Up with two expansions (from AEG), Onirim (€3 in a bargain bin for the first German edition) and Thurn and Taxis (€12 for a very good condition second-hand copy) – so if anyone particularly wants a review of those, just let me know! This entry was posted in Board games, Essen, Games by Chris Marling. Bookmark the permalink.